I truly do. Libby, of Truly Myrtle, is always cooking up some great design and Lisette is one of her newest. I love it. It's taken me too long to post about it. First, it was a secret test knit, so I couldn't. 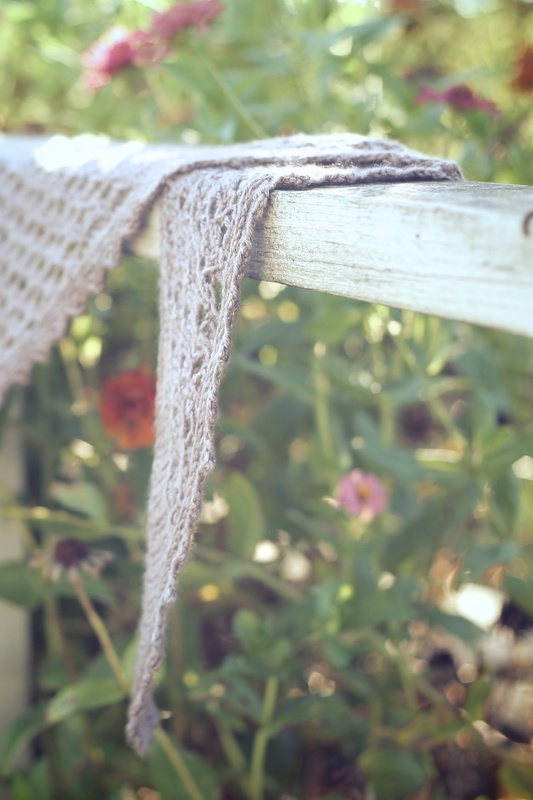 Then, when it was released, I had reached a point, in the heat of this summer, where the idea of having wool next to my skin out of doors made me feel faint. We've had warmer summers, ones where I ran in 99 degree heat, but it was so dry this year that I often felt like my brain was baking in the dutch oven of my skull when outside. And no, I wasn't hormonal. 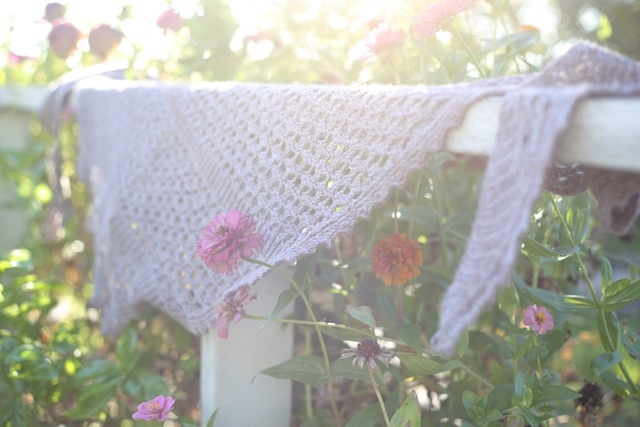 So, it took a knit-along deadline to get me motivated to photograph some knits outside, last week. Lisette is completely knitted, but seems to mimic crochet, which I find so interesting. There's a retro feel to it. 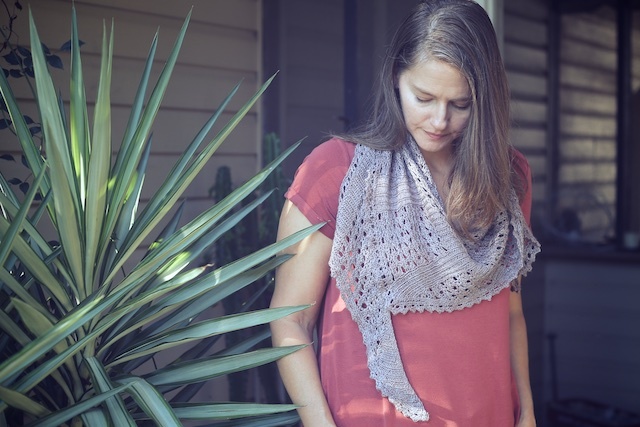 I've said before that I'm not too into ultra feminine, lace shawl designs because I'm just more a of a practical dresser. I'll be wearing jeans or leggings and boots. (workboot looking boots) possibly lots of sweatshirts and plaid this winter. 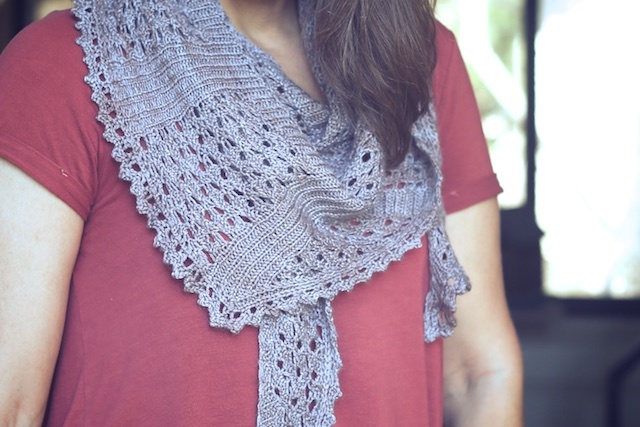 I can't imagine some of those intricate lacey shawls I see online looking right on me. 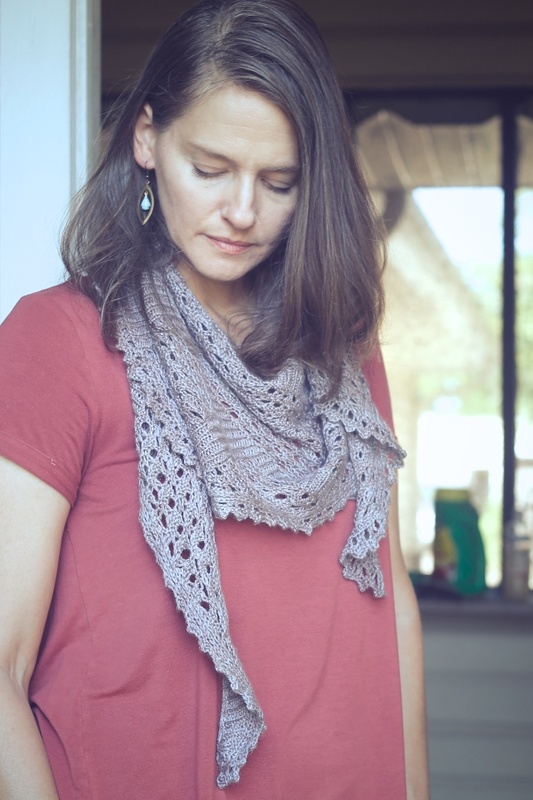 Yet, here I am knitting another lace shawl from Libby and I love it. It's not froufrou, but airy and vintage- looking. Strange as it sounds, the whole time I was working on it, I kept think if vintage prints, gingham fabrics like the kind I use as a picnic blanket. Maybe this is why I want one in linen/ cotton. The pattern is super clear and charts are my best friend. I can screenshot a close-up of one and keep it handy on my phone for working a section while I wait in the car or in the doctor's office, etc. Details, details: I used Size US 4 circulars and a skein of Voolenvine Yarn's Gatsby base in the Nevermore colorway. It was one of her first attempts at dyeing non-superwash, which I can appreciate, so it isn't the saturated color you'll find her Nevermore to normally have. 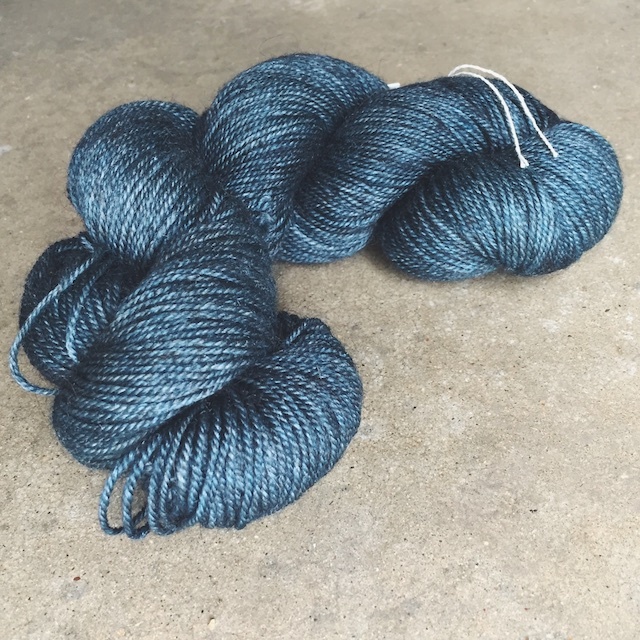 I knew that when I bought it, but I was interested in a less variegated, light colored, non-superwash skein from her. And that's what I got. 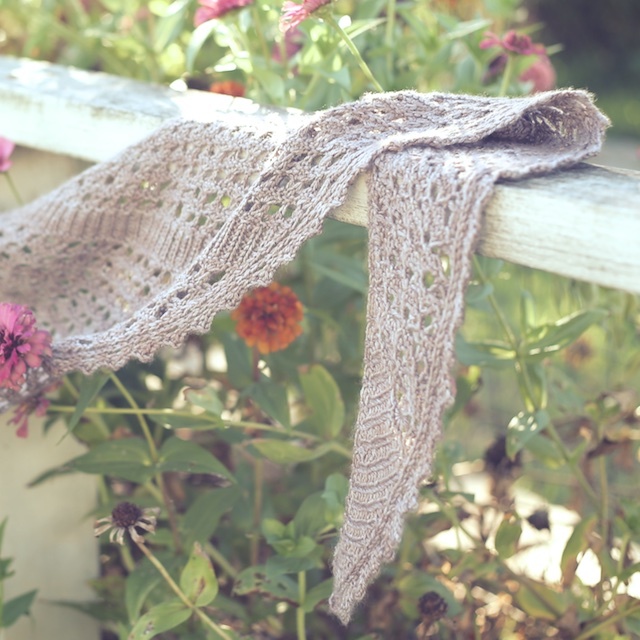 It worked well for a lace pattern and I really liked the feel of it in my hands as I knitted. I want more Gatsby in the future. 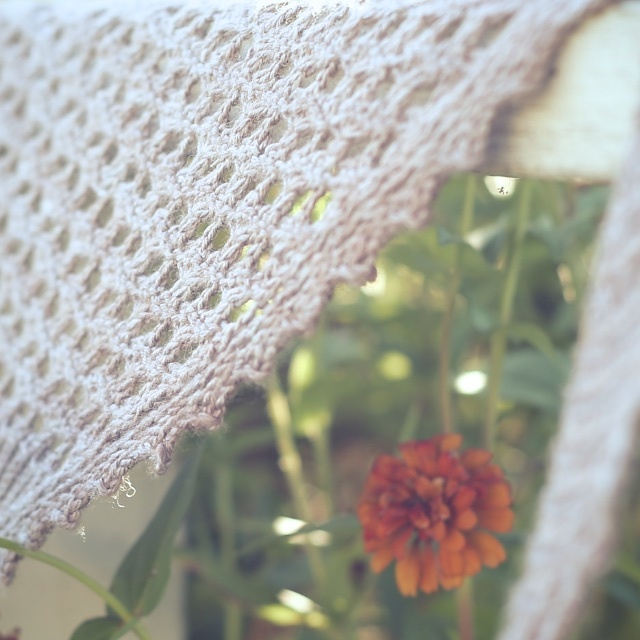 Blocking was an issue for me, as it often is for shawls. I pinned it out and tried to pin out the little points on the edge, but I didn't have enough pins and it didn't have the defined look I knew it could have. 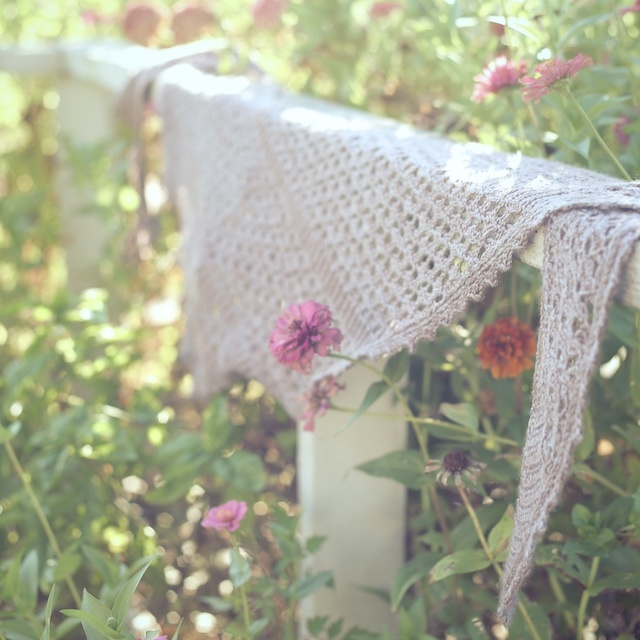 What worked for me was to pin the body of the shawl to the correct dimensions, then steam block the edging on my ironing board with a damp towel over the shawl. Works like a charm. But, yeah, I still need blocking wires. So this is maybe my seventh knit from Libby. It is completely safe to say I love her style. Not just her design style, but her personality via her blog, mini-mags, and podcast. There is nothing I like to do more in the evening than walk the dog (dogs) and water my garden while listening. I think I actually focus better on my audio-only podcasts than the video kind because of the meditative nature of what I'm doing when I listen to them. Plus there's always content that gives me something to think about. 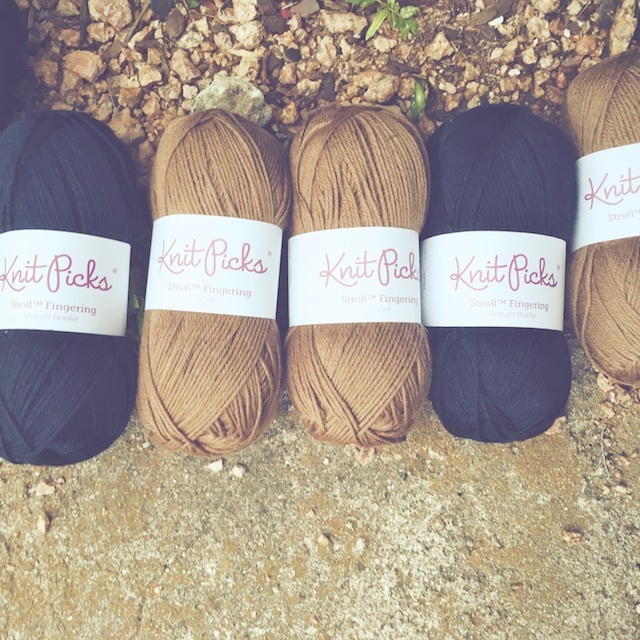 It's not just a list of her WIPs and new skeins in her stash. Hers is always my first choice, if there's a new one in my feed. Next up from Libby, in my queue: I need to make a Joss. I need to. I Still have some Stroll waiting for it in colors not too different from her sample. It's so graphic and interesting. Good grief friends, I will need to wear a different shawl a day when cold weather gets here, if I want to wear them all this winter. I might even have to make mid-day wardrobe changes. 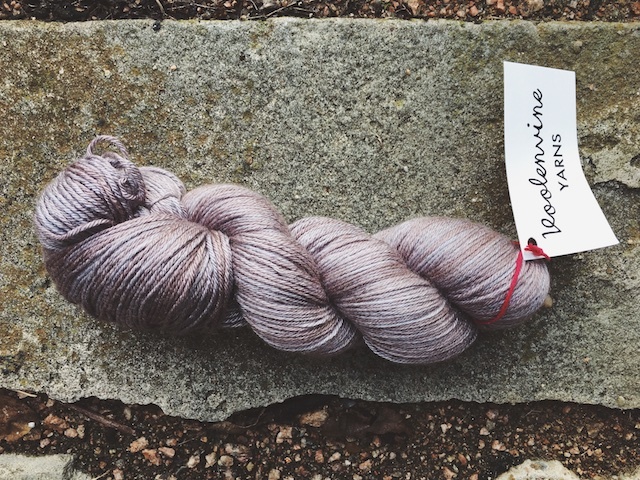 I'd also like to use a Copper Corgi skein I have for a Reminisce. It's possible I could squeeze it into the Hey Sister Hat KAL and the Harvest Hat-along. Then, you know that sweater design in an upcoming collection she's been discussing on her podcast? The one she affectionately calls the Chicken Lady Wrap? Look at the WIP photos. Don't you want one?